RACE HAS BEEN RESCHEDULED DUE TO FORECASTED THUNDERSTORMS. MORE DETAILS TO FOLLOW SOON ABOUT RAIN DATE. Experience one of North Carolina’s most beautiful parks while you and your family walk and run a beautiful 5K course at Dorothea Dix Park. A 1-mile walk/run event is also available. This fun family event features special family pricing and focuses on building strong and healthy families which makes it one of the most impactful family events in Raleigh! Registration includes a soft cotton t-shirt as well as a Pinwheel Temporary Tattoo as part of the Pinwheels for Prevention® national campaign to raise awareness for child abuse prevention efforts. Sign up now and come to Pre-Race Packet Pick-Up. Online Registration closes Wednesday, April 10th, however registrations received after April 1 may not receive a t-shirt. Post-race refreshments will be available for runners as well as vendors, exhibitors and games for kids. 6:30am — Race Site opens for parking. 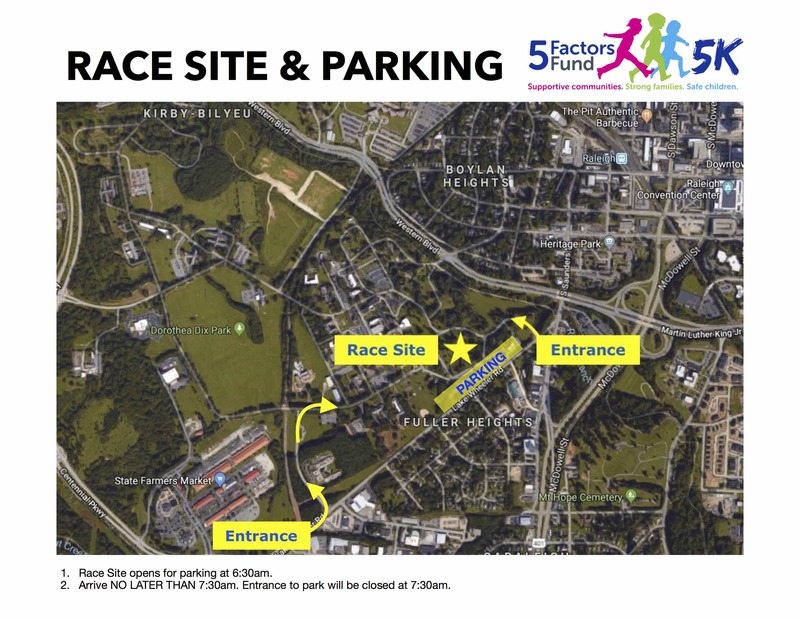 6:30am — Race Day Packet Pick-Up opens at Race Site (Harvey Hill). 7:30am — Race Day Packet Pick-Up closes. 7:30am — Road Closures begin. 7:30am — Race Expo at Harvey Hill officially opens with sponsor and exhibitor booths and activities for families and children. 7:45am — All Race Course and associated roads closed. 7:50am — Guest speaker, Kristin O’Connor, Section Chief Child Welfare Policy and Programs North Carolina Division of Social Services delivers Opening Remarks. 8:00am — 5K Race Starts. 8:20 am — 1-Mile Race Starts. 10:30am — Race and Race Expo with sponsor and exhibitor booths and activities for families and officially ends. 11:00am — All Race Course and associated roads now open.